Enjoy viewing a variety of artifacts from the Illinois State Museum’s Collections, including various, rare mammal taxidermy mounts, shark jaws, whale bones, and exotic insects. Fun crafts to take home! 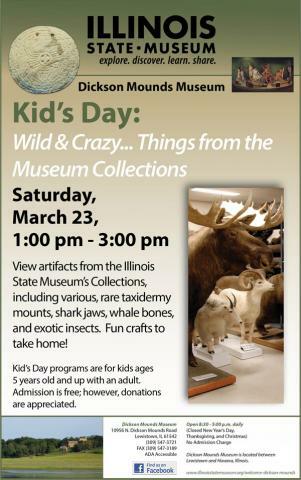 Kid's Day programs are for kids ages 5 years old and up with an adult. Admission is free; however, donations are appreciated.